Possible Uses Current use cattle ranch , possible use Solar Fields. Gem of the Sierra's - located approx. 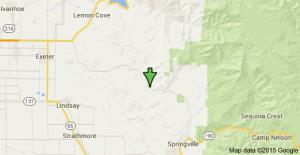 25 miles east of Visalia, approx 3000 acres - Possible Solar Fields. Newer mobile home 3 bedroom, two baths, gas & heat, large patio, attached 2 car garage, shop/tack room, water, 2 year around creeks, 9 ponds and domestic well & pump. current use cattle ranch, new pipe corrals w/ loading chute & scales, holding pens w/ water & large 100 ton barn. Land: working cattle ranch divided into 4 separate pastures with water at both ends of each pasture. Carrying capacity 300 pairs year round, terrain is mostly gently rolling with elevations from 1000' - 3000'. Wildlife: Good cross section of wildlife, such as wild pigs, deer, coyotes, bob cats, bear, quail, ducks, dove, rabbits & wild turkey. Utilities: Electricity & telephone service. This is one of the finest cattle & recreational ranches in the Sierra mountains. This ranch would be more than ideal for Solar fields, movie locations. The ranch has an excellent income from approx. 300 pairs on a year round basis & cell tower. Loverly oak trees, waterfalls, ponds, streams, hiking trails, and scenic rolling hills make this ranch a Gem of the Sierra's waiting for you. offered at $6,100,000. (six million one hundred thousand dollars). call, email, text for appt. to view this opportunity before it's gone!